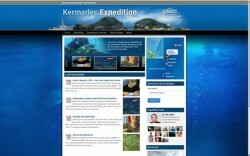 Kermadec Expedition blogTaking the public on a scientific expedition to the remote Kermadec Islands using social media is not as easy as it sounds! 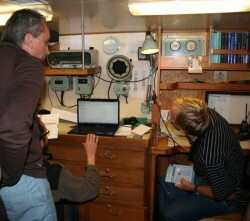 Behind this blog lies a satellite communication system set up on a Research Vessel – allowing Auckland Museum scientists (and others) to communicate back to a shore team in real time, and the public to discover expedition findings as they occur – discussing content or leaving questions for scientists to answer. In May 2011 Auckland Museum led an expedition to the Kermadec Islands, a New Zealand territory that is half way between Auckland and Tonga. The expedition involved 13 scientists from five agencies and set out to record the biodiversity of the marine and land environments. The Kermadec Expedition was a voyage of discovery that had the potential for a high level of public interest in the journey and the team’s daily findings, as well as opportunities for a wider audience to learn about New Zealand’s natural environment and the process of scientific research. The problem: How to set up and keep a flow of information between the team onboard the Braveheart ship at the Kermadec Islands and Auckland Museum, and how to distribute and share this information with the public during the expedition in a simple and engaging way. The solution: a satellite system, elbow grease, and a social media platform. Setting up communications on the shipDuring the 21-day expedition, the team onboard the ship sent daily diary reports, images, videos, and audio clips back to Auckland Museum via a science communicator; which were published online by a shore team as close to immediately as possible, and managed within a customised Wordpress blog site. Questions and comments from the growing audience on the blog were also conveyed back to the ship by the shore team in the Museum, and answered daily. “Awesome!! How big is that spotted black grouper? How do you actually catch the fish? And is it cold swimming? Fantastic videos – thanks!" This was a huge success with a number of new species found, and discussed on the site; people able to view actual images and videos of the scientists at work, listen to the atmosphere on the ship, and read answers to questions raised (including at times by other scientific experts in the wider community). The blog received over 10, 400 visits during the month of May, and over 200 comments were made on around 50 multi-media posts. On average, people spent 5 minutes on the site each visit; and the blog had a return visitation rate of over 62%. Audiences love a good story, not necessarily a new one. If you think technology projects in the Museum are stressful, try setting up a ‘never been done before’ system for transferring multi-media blog content from a ship in a volcanic zone! Little things, like the Museum’s spam filter rules blocking data transfer, challenged the team to think laterally along the way. Dissolving the boundaries between Museum staff in the marketing and communications division, curatorial, education, technology and web teams, and the public helped to make the project an all-round success. But the question of what to do with the blog once the excitement and immediacy of the trip has died down is an important one to consider. Using non-scientific experts as a barometer for potential interest in content was important, and there is no doubt that having an experienced science communicator as the eyes and ears on the boat helped - as did being prepared to answer and convey comments beyond the normal working day. Neither the ship nor the public keep 9-5 hours! The blogging medium helped capture and engage an audience, but using traditional media coverage and a multi-channel approach helped to grow it. Discernible spikes in traffic were noticed every time the expedition was covered in mainstream media. This also makes the impact difficult to quantify, spanning the blog site and third-party mainstream media sites re-distributing videos, images, audio, and straightforward accounts of key findings.